“Just look at this turn-out! And we’re only 15 minutes into the night. Like WE’RE always running late!” – Laura Alcalá Baker, casting director and artistic programs manager at Victory Gardens. The crowd attending the ALTA awards that evening at Victory Gardens Theater had packed the lobby barely 20 minutes into the cocktail hour! 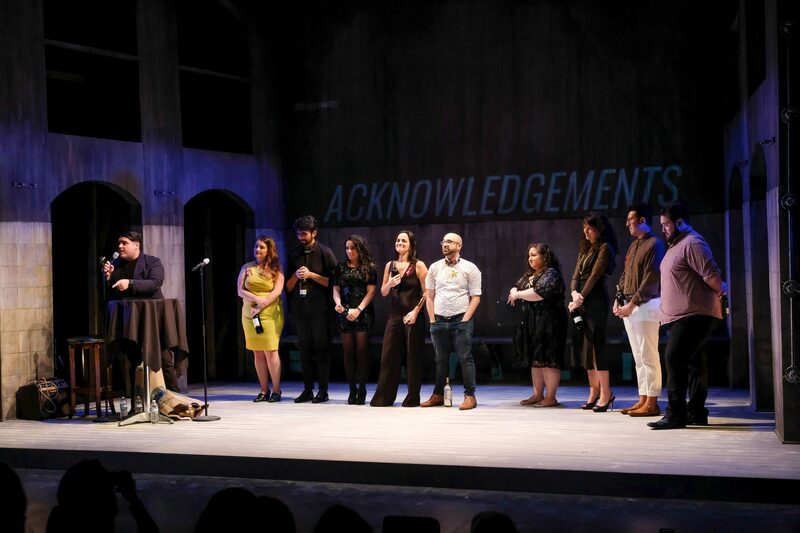 ALTA – the Alliance of Latinx Theatre Artists in Chicago hosted its first ever Awards Show last Monday evening. ALTA is a crucial, “service organization dedicated to furthering the Chicago Latinx Theater movement by promoting, educating, representing, and unifying Latinx identified artist and their allies.” All of the love inside that fully packed house at Victory Gardens Theater was proof of just that. So much love that everyone clapped for every single nominee when their name was read as well as the winner, for each category. The ALTA Awards wasn’t just an evening of celebration for the Latinx identifying theatre artists, it was also a call to action for the rest of the Chicago theatre community. Compared to other major theatre award shows in Chicago, how often do we see the multitude of talent and disciplines represented? The work that was celebrated last Monday is important particularly in an Anglo dominated industry. This work celebrated at the ALTAs had been long overlooked by other major theatre awards (ie. The Jeff’s). The ALTAs highlight Latinx artists and their work in ways that other major theatre awards just can’t. Who can better highlight our community than ourselves? As my Mamá (grandmother) says, if you want something done right, do it yourself. The ALTA Awards are an evening curated by Latinx artists for Latinx artists. The Co-Creative Directors of ALTA, Isaac Gómez and Nancy García Loza outlined their intentions for the event: “We wanted to uplift those our community has deemed outstanding, and to celebrate LatinXellence in a way that has yet to be seen in other large annual awards institutions. ALTA members, not a committee or panel of judges, submitted nominations and votes, and the results of that tally will be revealed and celebrated this evening.” To even further level the playing field for potential winners, the tallies were counted by ALTA members and a third party. It was amazing to see all theatrical disciplines represented, instead of the typical Best Actor/Actress. The ALTAs didn’t conform to the binary, except when there was a tie. Some stand-out categories include Outstanding Art Specialization and the four Legacy Awards which honor four artists, mentors, activists, and advocates who have paved the way: the Luis Alfaro Leadership Award, the Migdalia Cruz Mentorship Award, the Luis Valdez Arts Activism Award, and the María Irene Fornés New Play Award. See below for categories and winners for the ALTAs. The ALTAs was a giant party for some, and a reunion for others- with complimentary margaritas. Everyone in attendance was literally dressed to the nines. Everyone, and I truly mean everyone, looked straight FIRE on Monday evening. Like better than what we see E! News report on the red carpet kind of fire. The first ALTA Awards was a night to remember. A night to acknowledge mi gente, our work, each other, y la cultura. Hope to see you next year at the ALTAs!